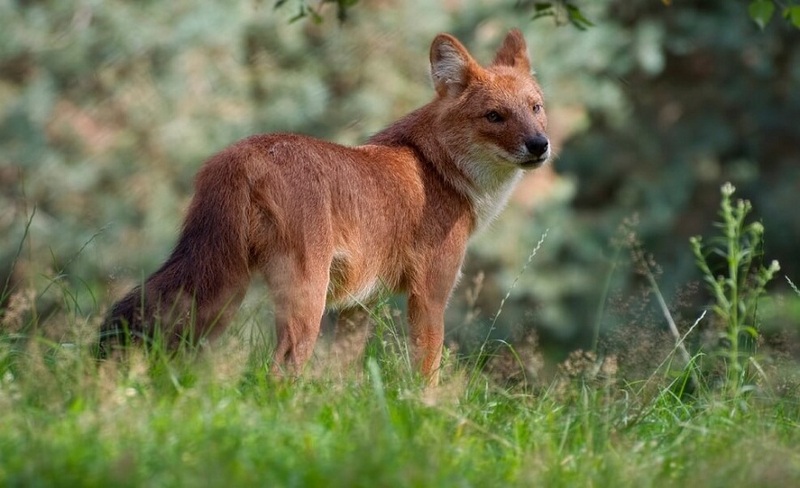 Dhole (pronunciation: /dəʊl/) is a species of canids native to a few Asian nations and is closely related to the ‘dog’ family, which also includes wolves, coyotes, jackals, foxes, and of course, dogs. Found in the jungles of the continent, they have been a highly endangered species, and is the only living member of its genus ‘Cuon’. Very similar in appearance to the African wild dog and the bush dog, their primary causes of heading to extinction are habitat loss, competition with other species, transfer of diseases from domestic dogs, loss of prey, and persecution by humans because of predation of their livestock. 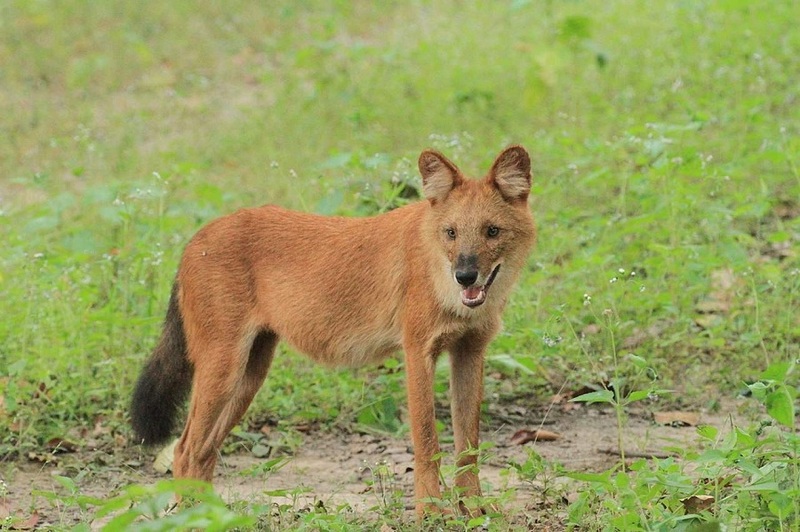 Because of this, keeping dholes as pets have been restricted by law. Size: A dhole is about 90 cm in length, with a height of 50 cm at the shoulder. Weight: They weigh between 12 and 20 kg. Body Fur/hair/coat: The hair on the backside and flanks is tan to reddish brown, while on the neck, chest and underside regions they have soft white or light colored fur. Head: They have a broad skull with a short but wide muzzle. Tail: The tail of a healthy, standard size dhole can be up to 45 cm. Teeth: Two rows of sharp teeth, with the canine pairs being sharper to tear meat. Sexual Dimorphism: Not distinctly present, with the males being slightly larger than the females. Dholes can live up to 10 – 13 years in the wild, while the average lifespan in captivity is 16 years. 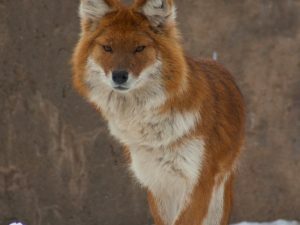 During the Pleistocene period, the population of the dholes ranged throughout Asia, Europe, and North America before it got restricted to its historical range about 12,000–18,000 years ago. 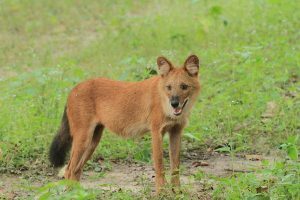 At present, dholes are found only in a few of the Central, South and Southeast Asian countries. Dholes prefer living in open spaces and are often seen around jungle roads, river banks, clearings in the woods, as well as paths. a. sumatrensis, or, the Sumatran dhole. Dholes are social creatures that live in medium-size packs with members between 5 and 12. However, groups of over 40 have also been reported. A member of one pack does interact with the members of other packs as well, but they maintain their territory. By nature, they are quite similar to the African Wild Dogs. Like the latter, they would involve themselves in group hunting and sharing food with the members, as also, take care of the young members of the group. These animals have an affinity for water. They would not live too far away from water bodies. After a meal, they would quickly move to the nearest water site for a drink. These canids have also been observed sitting in shallow pools even when temperatures are low. Dholes have a great sense of harmony amidst the members of their packs. They have very rarely been seen showing aggressiveness towards each other, nor is there any bullying. These dogs are also known for their vocal calls, which they use to communicate with their pack members. The majority of the dhole’s diet is made of small animals like lizards, frogs, rodents, etc. However, they are basically omnivorous and would even live on fruits, especially when food is scarce. Dholes are monogamous in nature, with each pack containing a dominant pair of dholes. After the mating season and the gestation period are over, the other members take the responsibility to take care of the babies of the dominant pair. 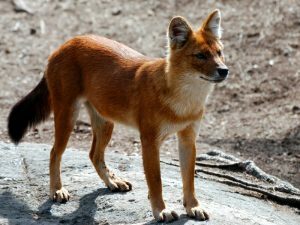 The gestation period of the dhole mother is 60-63 days. When the time comes, the female gives birth to all its puppies at a time, one by one. The time for the pups to take birth falls throughout the end of November until March. The father, mother and the other members help each other constructing a den near streambeds or among wild rocks. The range number of offspring is 2 to 6 (average 5). 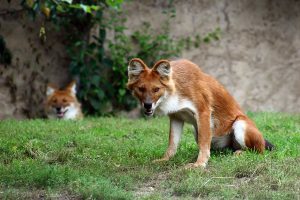 After a mother dhole has given birth to the cubs, some of the other adult members take part in feeding the mother as also its juvenile babies while they are around 3 weeks old and gradually learn to intake solid food. Both the mother and its babies are fed regurgitated meat. The cubs, like dog-puppies, to play fight amongst themselves. 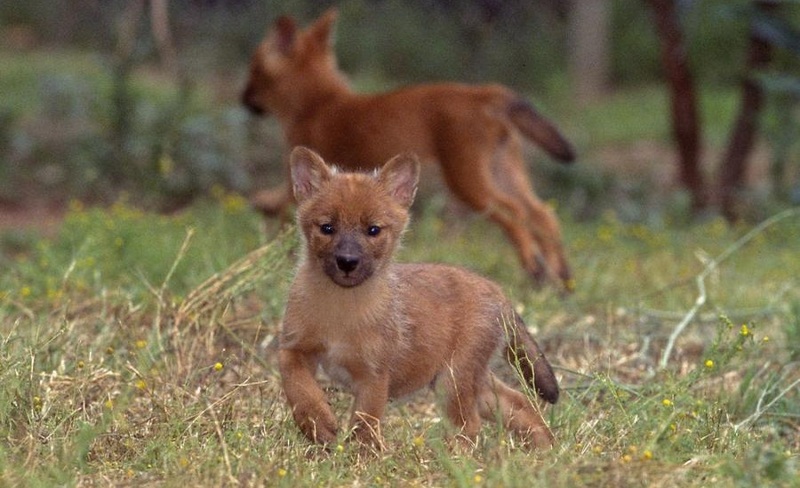 The average age of weaning of the baby dholes is around 58 days (approximately two months), while the age of sexual maturity in both the male and female young is one year. 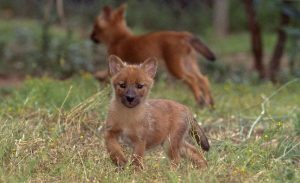 Female dholes can have up to 16 mammae to feed their young ones, which suggests their ability to take care of large litters. As a behavioral adaptation, dholes live in groups, which prevent many other animals from attacking them in the wild. 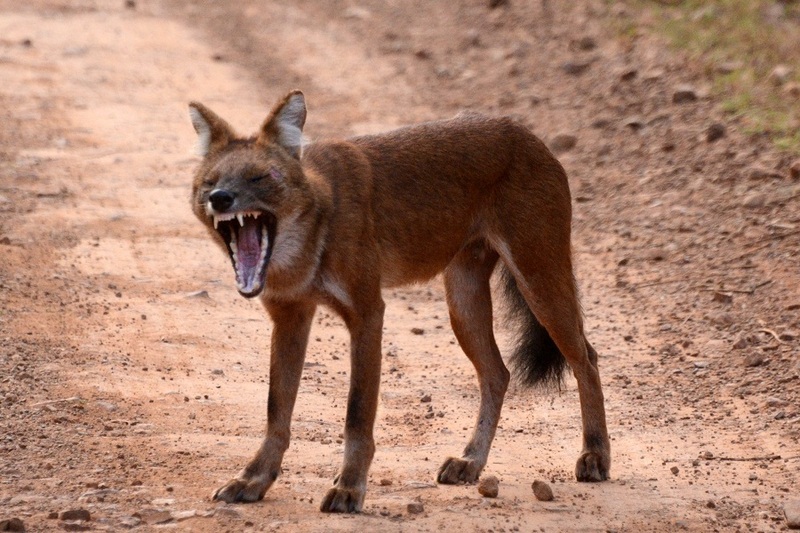 The only predators of the dhole in the wild are the large cats like tigers and leopards. However, their primary enemy is human. Because of their quickly degrading population, the IUCN 3.1 has declared them as ‘EN’ (Endangered). Just like domestic dogs, the dholes wag their tails when pleased. 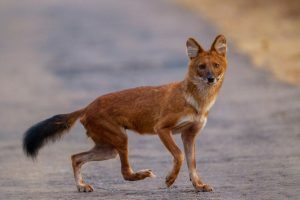 In general, dholes were (and still are) locally known by many English names including Indian wild dog, Asiatic wild dog, whistling dog, red dog, and mountain wolf. Biologists say that dholes have excelled as survivors, or else, they would have perished centuries before. The proof is that they have been existing in the planet since the last Ice Age. 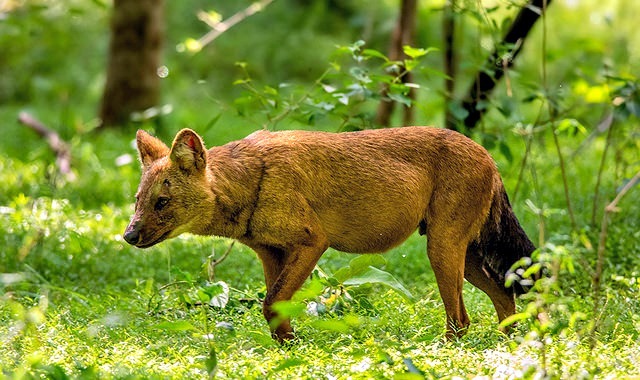 It is said that, the dholes’ repetitive whistles are so distinctive that individuals in a pack can easily be identified by their respective sounds.